Last week we joined a regular விருந்து Tamil Feast held at the award-winning not-for-profit CERES in Melbourne. The feasts, traditional Sri Lankan fare – (here’s a taste of our night’s menu: Richman’s Aloo Bonda with tomato and coconut sambal, Niro’s special eggplant curry, and Nirma’s pumpkin and spinach salad) – are served up three times a week by Tamil men currently seeking asylum in Australia, providing the opportunity for the cooks to “share their culture, their stories and themselves, with the wider Australian community”. This one had additional meaning and purpose: to raise money to support the Tamil family – Priya, Nades, and their two young Australian born children Kopika and Tharunicaa – who were awoken in a dawn deportation raid in March in the quiet central Queensland town of Biloela (Bilo) by the Australian Border Force. 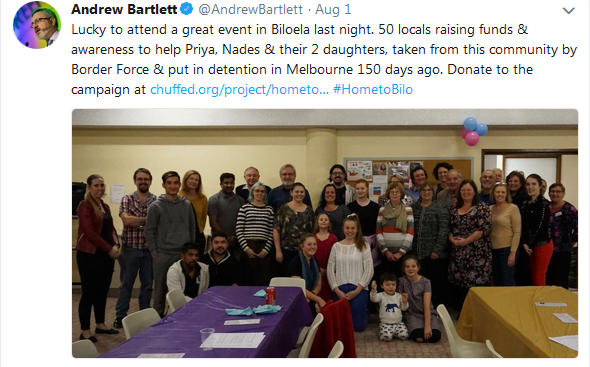 The packed support event in Melbourne accompanied one with similar numbers, including Greens Senator Andrew Bartlett, in Biloela to mark 150 days in detention for the family, and to launch a crowdfunder to raise $20,000 to ensure Priya has expert legal representation when she appeals to the Federal Court on 27 August. 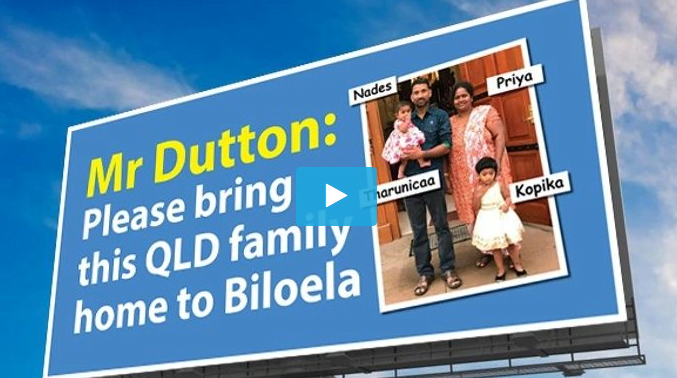 Organisers hoped to raise enough money to also be able to send a big message to Home Affairs Minister Peter Dutton to listen to appeals on behalf of the family (see billboard feature image above). That crowdfunder on Thursday met its target (though I am sure the #HometoBilo team would love people to keep donating, as the family’s legal fees and advocacy needs will no doubt continue). Simone Cameron, a former Biloela resident who has helped spearhead an extraordinary community campaign to support the family and demand they be able to return to Bilo, has written about the family’s plight previously at Croakey here. Because that was the rub. 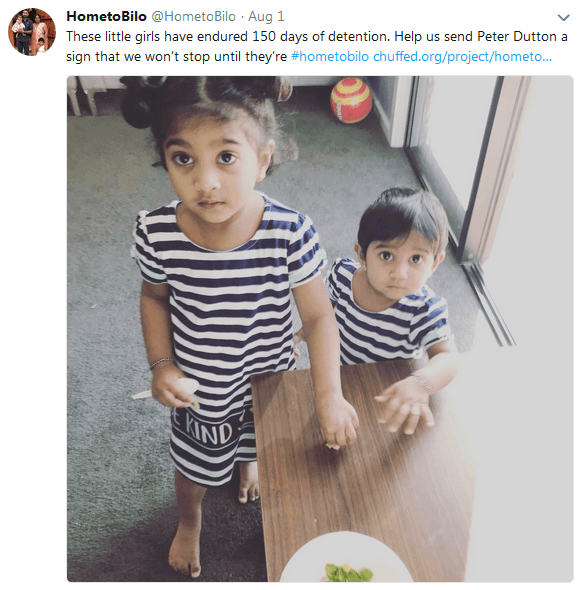 As we gathered to share fantastic food in their names, Priya and her family remained in detention, thousands of kilometres from their home in Biloela. 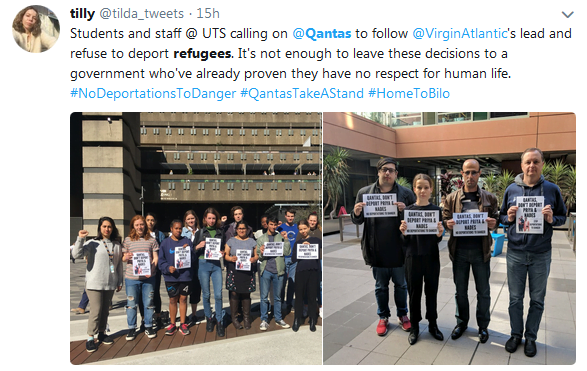 And others like them, more people fleeing persecution and war, remain stranded in even crueller offshore detention on Manus Island and Nauru. So it was good too to learn of other communities (or at least passionate members of them) working to change hearts and minds, and to hold the Australian Government to account on its treatment of asylum seekers. That was particularly so in a week when a coronial inquiry in Brisbane handed down damning findings into the death of Hamid Khazaei after suffering severe sepsis from a leg infection on Manus Island and another in Perth opened (and due to close today, Friday, with vigil action planned by the Refugee Rights Action Network WA) into the death of refugee Fazel Chegeni Nejad, who survived torture in Iran only to die on Christmas Island. I was lucky enough to share a Tamil Feast table with Ruth Halbert, artist and activist from Denmark, 423 kilometres south-east of Perth, and to do a quick interview with her about her campaigns for more just asylum seeker policies in Australia. You can watch the interview or read the edited transcript below. 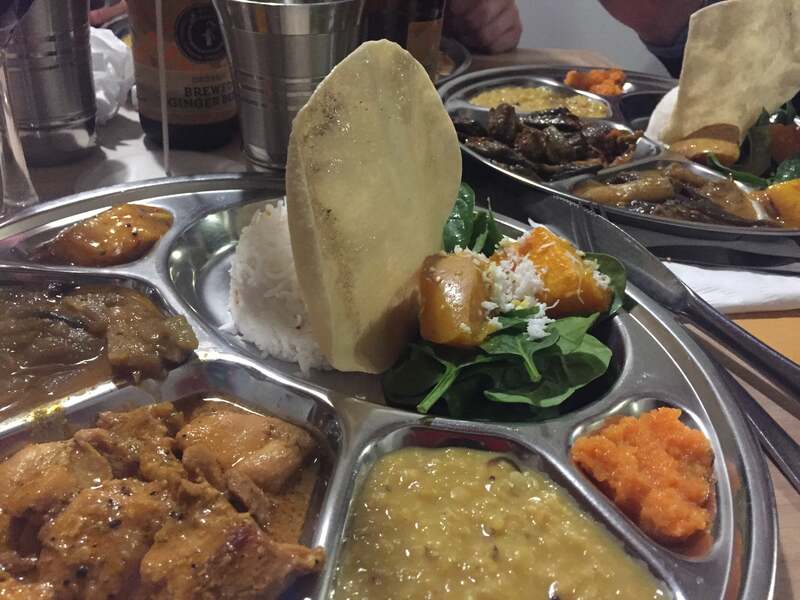 Ruth Halbert: Tonight we are at a weekly event at CERES which is a Tamil feast, but particularly tonight it is a fundraiser for the Tamil family from Biloela in Queensland who have been held in immigration detention for 150 days. Priya, Nades and their two very young daughters, and they’re in detention while they’re waiting for the result of one of the legal appeals surrounding their case. Marie McInerney: I’ll point people at Croakey to more information about the family but you were telling me over dinner that you’re very much involved in refugee politics at home in Denmark (Western Australia). Can you say what you been up to and that includes writing many letters to the Prime Minister? Ruth Halbert: When you’re in a small country town – Denmark has only about 5,000 people and it’s 450 kilometres from Perth – we feel like we’re a long way from where a lot of the action happens, for instance in Melbourne where there are so many protests and so on. I was motivated mostly by an increasing sense of outrage about offshore detention and in particular the death of Omid Masoumali on Nauru (who died, aged 23, after publicly setting himself on fire in protest at his detention during a UN monitoring visit) and the way he was treated. I decided I needed to take action even though I have no qualifications and I really felt I didn’t know everything about the situation. So I set up an ongoing daily practice of writing a letter to the Prime Minister, and I considered it a part of my practice as an artist. So every day I wrote a letter to the Prime Minister about the refugees in Manus or Nauru and I used it as a way to amplify their voices when I could. From doing that I had the letters performed as a spoken word piece at a festival in our town. Then I was inspired by the author Isobel Carmody who late last year was in the United States finishing her PhD. She was particularly concerned about what was happening on Manus when the men in the Lombrun detention centre were being forcibly removed by Australia into the town of Lorengau. I thought this is something I can do in the south coast, in Denmark. I started standing just on the street corner for an hour, not every day of the week but most days. I was holding up a sign that said: ‘Free Manus. Free Nauru. I am watching’. After a while a few other local people said, ‘we really love what you’re doing, can we join in?’ So since November we have been running a weekly vigil: every Friday evening from 4-5pm, we stand on the street with our signs. In the neighbouring city of Albany it happens every Saturday morning from 11.30am-12.30pm. We’ve also held protests outside the office of our local MP Rick Wilson. We’ve held vigils. We held one early this year to commemorate four years since the death, since the murder, of Reza Berati on Manus (during riots in February 2014). And our most recent protest outside our local MP’s office was on the 5th anniversary of the 2013 (announcement by the Rudd Government of indefinite offshore detention). On that occasion our Federal MP Rick Wilson advised his staff to close the office and lock the doors, so there were about a dozen of us, mostly members of the Anglican church, holding our placards out on the street and the office was too afraid to engage with us, even to have a conversation. Marie McInerney: We’re rushing through this (interview) because we have a bit of a battery problem, but you also have connections to a group that’s keeping an eye on a coronial inquiry in Perth? Ruth Halbert: Yes, that’s right, there’s a coronial inquest into the death of Fazel Chegeni Nejad, who died on Christmas Island. He was judged to be not of adequate character to stay in Australia and then locked up. His case was such that he would have been in indefinite intention because there was no way he could have been returned to Iran. He was a Kurd and had suffered extreme torture and would have been in extreme danger going back to Iran. He was found dead outside the perimeter fences of the detention centre on Christmas Island. (The inquiry) is currently happening at the Coroner’s Court in Perth. Refugee Rights Action Network WA: which has been closely following the coronial inquest into the death in custody of Fazel Chegeni Nejad. Activists Michelle Bui and Suvendrini Perera who have been filing dispatches from the coronial hearings here. Music from Manus: 5 Days not 5 Years, a documentary of Manus from Denmark (WA) musician Dawn Barrington and filmmaker Tim Maisey. And you can follow Ruth Halbert on Twitter at @RuthHalbert and at Instagram. Also if you can’t get to the Melbourne exhibition (before it closes tomorrow, August 11), please check out the powerful All We Can’t See: Illustrating the Nauru Files. 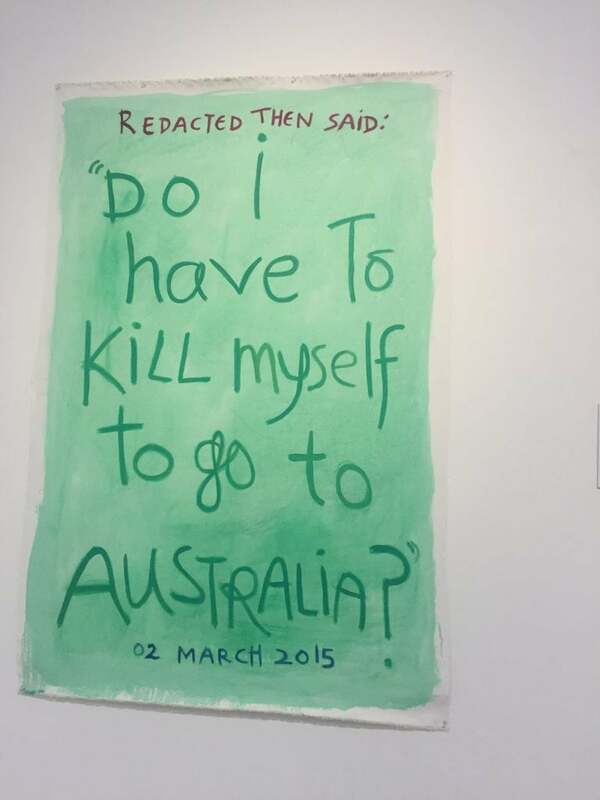 Many art works, by known artists like Ben Quilty and others from the wider community including schools, seek to illustrate incident reports written by staff in Australia’s detention centre on Nauru between 2013 and 2015 and leaked to the Guardian in 2016, the largest cache of documents to be leaked from within Australia’s asylum seeker detention regime. The reports are devastating in their catalogue of cruelty and harm, including many cases of assault, sexual abuse, self-harm, child abuse and abhorrent living conditions endured by asylum seekers and refugees in the care of the Australian Government. They include harrowing accounts of ingestion by asylum seekers (of rocks, insect repellent, washing powder and baby bottle sterilising tablets) and other accounts of self-harm, including one child who sewed a heart onto the palm of his hand. 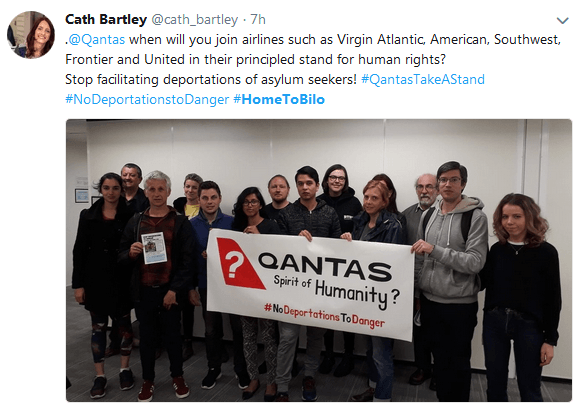 Activists have also this week taken protest action against Qantas’ participation in the Australian government’s refugee and asylum seeker policies. 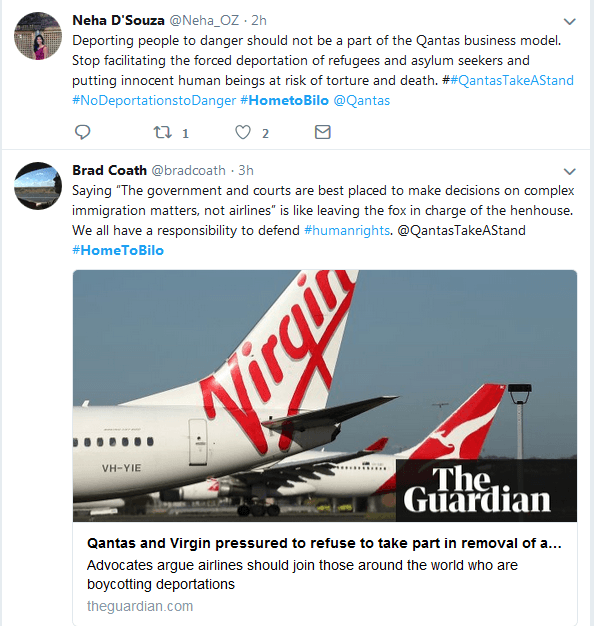 The Human Rights Law Centre said this follows the release of an expert statement signed by a number of business, human rights and union groups and individuals, which notes that ‘airlines should engage a heightened due diligence process’ to ensure they do not contribute to human rights abuse by facilitating deportations, removals and transfers. Signatories to the statement include Janet Holmes à Court, barrister Jennifer Robinson, Thomas Keneally AO and Professor Gillian Triggs. Where to now for addressing obesity in Australia?